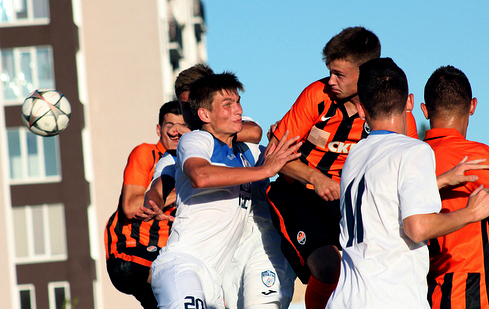 Shakhtar are the only team in the U21 league to have claimed wins in two opening rounds. First, the Orange-and-Blacks beat Vorskla away (3-1), also defeating Dynamo Kyiv last Saturday (1-0). Currently, the Donetsk are topping the table with 6 points, breaking away from the nearest pursuers (Zorya and Oleksandriia) by two points. The injured defender Viktor Korniienko still can’t help his teammates, being replaced by Oleksandr Masalov at left back. Stal finished in the 7th spot last season, thrashing their opponents in the league’s second stage. In the summer, the U21 side coach Eghishe Melikyan was promoted to become the first-team head coach who took the team leaders away with him, while the U21 line-up was headed by Viktor Zhuravlyov who had previously worked with the U19 team. In the first round, Stal suffered a major defeat at the hands of Zorya (1-6), conceding three goals in each half. The visitors’ only goal was notched up by Kopytov. Then the Kamyanske-based team played in Odesa, being tied with Chornomorets (2-2). Zhuravlyov’s men opened the scoring early in the second half (Kushnarenko) and almost immediately doubled the lead (Vakula converted a spot kick), but failed to retain the win, conceding two goals in injury time. The opponents met 4 times in the U21 league: 3 wins were claimed by the Miners, another match ended in a draw. The goal difference is 11-3 in favour of the Donetsk team. In the 2016/17 season, Shakhtar twice defeated Stal with the same score of 3-0. The winning streak of the Orange-and-Blacks has involved 8 games to date, in which Valeriy Kryventsov's lads scored 19 goals and conceded only 3. Last season, Viktor Zhuravlyov coached Stal U19 and twice lost to the boys of Shakhtar – 0-5 and 0-2. Sign up to the Telegram and Viber accounts of FC Shakhtar and follow the games of U21 and U19 teams.